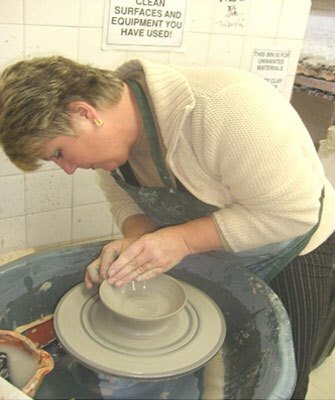 Since an early age I have been a ceramic artist, graduating with a first class honours in ceramics 8 years ago, from The university of Central Lancashire. I was a very modern artist and hated anything connected with drawing or fine art. 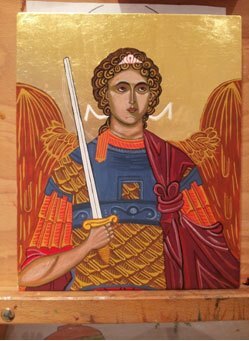 So, it was a complete change of direction when I started writing icons four years ago, after becoming a Knight of St Michael, when on pilgrimage to Italy, I was invited to go with some very spiritual people to write an icon of St Michael in Ireland. Without doubt it transformed me, it was an incredible experience, and I loved every minute of it, when I got back I just kept asking The Lord the question how can I write more icons? Where can I go? The very next day I came here to St Marys for an exhibition for Our Lady and I had put in some photos from various pilgrimages I had been on and when I walked into the church across from the door was a table with all these beautiful icons on. This was when I first met Linda , she was a fellow parishioner. 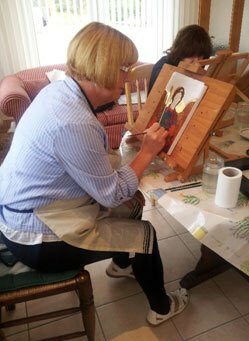 I told her I had just come back from writing my first icon and she invited me to go with her to Hynning Monastery every Wednesday where there was an icon class run by Sr Stella, one of the Bernadine sisters, who had written icons for many years. To be honest I was quite overwhelmed, I had just been asking Our Lord to help me write more icons and then met Linda, Our Lords plan without a doubt, question answered!! The rest is history as they say, I went with Linda the following week and have been going every week for the past four years but also have a room at home where I go most days to write the icons in prayer and meditation. 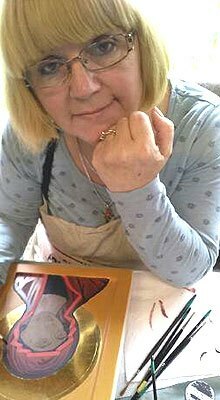 It has been a total change of direction, quite a transformation and after 50 years of having my hands in clay or on the wheel or building pots, I am now writing icons. So far removed from anything I had done, but I feel this is truly where The Lord wants me now, where my journey to him is becoming so much clearer and stronger, through the meditation, prayer and writing the icons. I along with my fellow iconographers have been very privileged also of writing icons with two of the most prestigious iconographers in England Peter Murphy who is a Master in traditional methods of icon writing in the Byzantine style, and with Irina Bradley a Russian Iconographer, who writes in the Prosopon school of Iconology and studied in Moscow. Both these amazing teachers have shown us how to write beautiful icons through prayer, patience, meditation and reflection. So I am still very much a beginner, I learn so much with every icon I write, there is so much still to learn, but for me every revelation is so amazing. In the Middle East and in Syria in the last few years, the birthplace of Christianity, our enemies know the importance of the icons, make no mistake about that, thousands of icons some over 1500 years old have been destroyed, usually the first thing in the church that is destroyed because even our enemies know how important to our faith they are, and the relevance that they have been meditated and prayed upon for centuries adds to their reasoning for their immediate destruction. So, we have lost many icons in this way, but here at Hynning and in little groups icons are being recreated through the traditional methods, they will never make up for the thousand plus year old icons destroyed but the beliefs in icons will not be destroyed. I am still learning, still very much a beginner and by no means an expert but absolutely love this blessing I have been given, and hope I can share some of the passion I have for icons. Writing an icon at Hyning in May on a week course with Peter Murphy. Our Catholic church decreed in the catechism of 1160 that Christian iconography expresses in images the same Gospel message that Scripture communicates by words. Image and word illuminate each other. This is why we say we write an icon, we do not paint it, we are writing the gospel in colour and form.